This is our eighth Case of the Week.� These cases can also be accessed by clicking on the Case of the Week button on the left hand side of our Home Page.� This email is only sent to those who requested to be on this list in writing or by email.� To view the images or references, you must click on the links in blue. This week�s case is sponsored by our Management Page, with a link on our Home page under Clinical Pathology topics (or click here).� The Management page presents information on business aspects of pathology practice, written by the experts, with new topics added monthly. 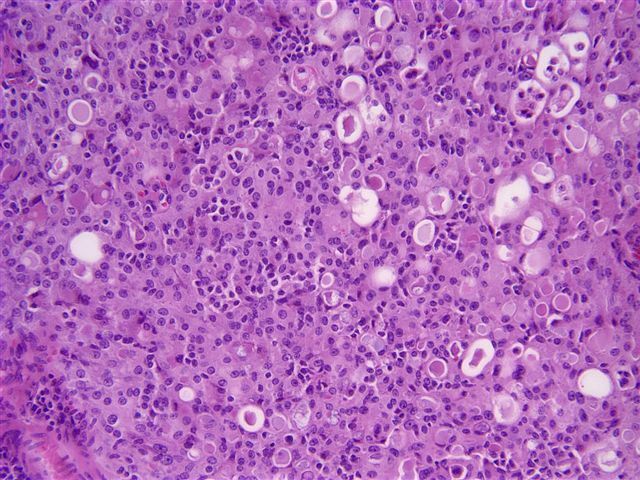 A 52 year old woman had a breast mass, which was excised.� She also had two positive axillary lymph nodes. 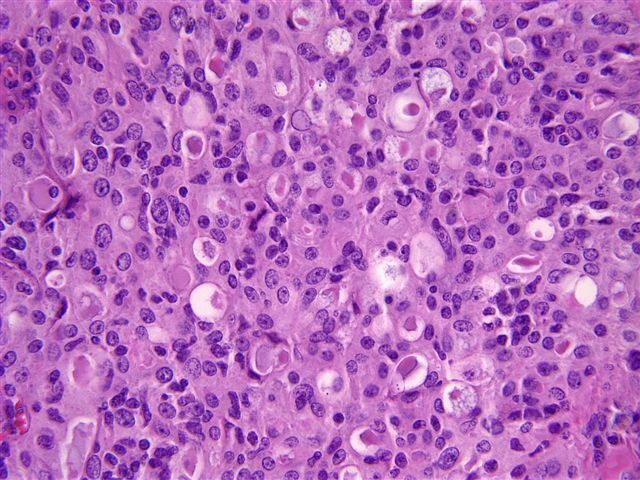 Secretory carcinoma of the breast is also known as juvenile carcinoma.� It is a rare subtype of breast carcinoma in adults, but is the most common form of breast carcinoma in children.� The tumors are usually small and well circumscribed.� Tumors are composed of tubuloalveolar or focal papillary formations of relatively bland cells with abundant pale to eosinophilic cytoplasm, often vacuolated.� Nucleoli are frequently prominent.� The most striking feature is the luminal eosinophilic secretions, which are PAS+ and diastase resistant (image).� Mitotic figures are rare.� It is often difficult to determine how much of the tumor represents in situ versus invasive disease.� The tumors have pushing margins, and often central hyalinization. Tumor cells are immunoreactive for S100 and alpha-lactalbumin with variable staining for GCDFP-15 and CEA.� They are often negative for estrogen and progesterone receptors.� Electron microscopy shows numerous membrane bound, intracytoplasmic secretory vacuoles.